July 2018 - Been a long time between posts. I'm starting work on the Touchguitar method. I'm also trying a new tuning on the Warr Guitar extending my ability to play bass lines. May 2017 - Posting new videos on youtube.com/touchguitar: Man in the Mirror - Chapman Stick, Overjoyed - Linnstrument. April 2017 - The jam session with Blues Brad's Band was a great time...we'll need to shoot some videos next time. Man in the Mirror - Linnstrument was posted. February 2017 - The NAMM show was a lot of fun. 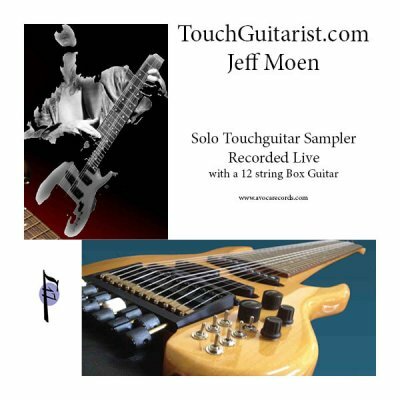 Since then I'm preparing to launch the Moen Music Method on JeffMoen.com. I just posted two videos of "On a Clear Day" played on the Linnstrument and Chapman Stick. Note that the chord forms and scales are identical!!! May 2016 - Had a nice jam session with Blues Brad and the guys...miss doing that! The Box guitar is finally up and going with new pickups - bette than ever. Learning analog programming with my DSI Evolver and Poly Evolver (finally!). November 2015 - Push2 and the Linnstrument are opening up new production possibilities. Looking forward to the results. July 2015 - Studio 717 is up and running again. I completed the buildout of my three room studio in the basement. Looking forward to many recordings here, after many years! December 2014 - The Open Arms Christmas service is Saturday December 13th at 4 p.m. Expect a lot of music, treats and fun! November 2014 - Enter the Linnstrument! I've been working with the Linnstrument midi controller for the past two weeks and thoroughly enjoying it. Checkout the first videos on my video page! September 2014 - The Open Arms Sunday at Alpharetta Presbyterian Church is September 14th at 10:45. It will be a service for people of all ages and abilities with special accomodations for the disabled. Tony Sims, Kevin Spears, Don Brainerd and I will lead the music. 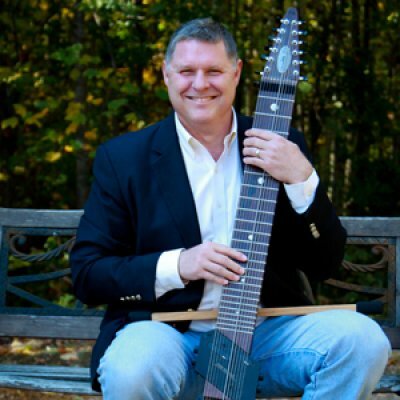 April 2014 - Performing regularly at APC and doing demos at Guitar Centers in TX, GA, MN, TN, KY. Hopefully I'll catch up with Ben Lacy in Lexington this month. March 2014 - Open Arms Easter Service March 22nd at 4 p.m. L'Arche Community, Jesus Cares - Mark Kipf juggling, Atlanta Autism Consortium. January 2014 - Playing regularly at the Alpharetta Presbyterian 9:50 service. I'm using my new Box Guitar at the service. December 2013 - Open Arms Service Saturday 14th at 4 p.m. Tony Sims is coming along. Played at the Fila Christmas party/GoLive in December. November 2013 - Using the new Warr Tuning and added the Box Guitar to my instrument group...love it! October 2013 - Playing regularly at APC Church, looking forward to playing with Tony Sims at the Christmas Open Arms Service and Get together. August 2013 - New Tuning!!! with a complex rhythm machine with fills. April 2012 - Committed to the Ascending 5ths/4ths Uncrossed tuning...yikes, gotta learn everything over again!